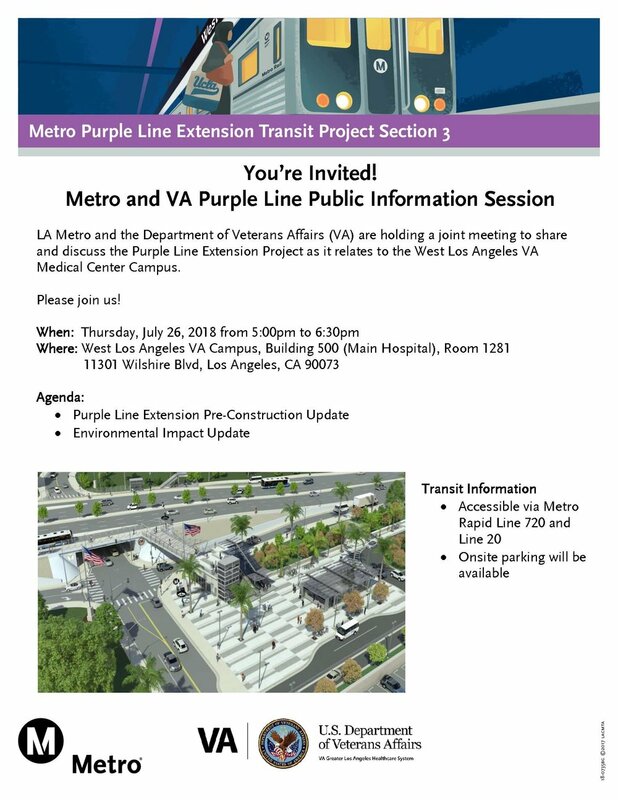 A joint meeting with LA Metro and the Department of Veterans Affairs has been scheduled to share and discuss the Purple Line Extension Project as it relates to the West Los Angeles VA Medical Center Campus. The public information session will be held on Thursday, July 26, 2018 from 5:00 p.m. to 6:30 p.m. at the West Los Angeles VA Medical Center Campus, Building 500, 1st Floor, Room 1281. For inquiries regarding the public information session, please call the VA Greater Los Angeles Healthcare System, Office of Communications main line at (310) 268-3790. One of Metro’s priority projects, the Purple Line Extension, is a rail project that will provide a high-capacity and high-speed alternative for commuters to travel between downtown Los Angeles, the Miracle Mile, Beverly Hills and Westwood, where stations will be near UCLA and the VA Hospital. Link to Metro’s Purple Line Extension website.